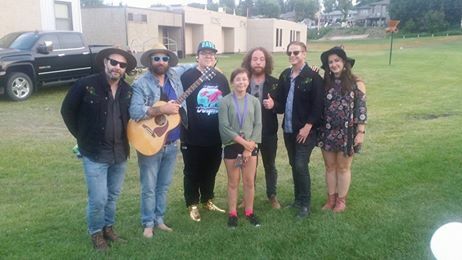 Young Christina performed with "The Strumbellas" at the Seven Festival in August. Christina Hollingworth, a member of Enoch Cree Nation, performed a song she wrote at her Edmonton school’s Remembrance Day ceremony yesterday. She was inspired by a wartime article about her great-great uncle David Keddy, who died at age 24 in action in Holland during the Second World War. He was a member of the Royal Montreal Regiment. Christina, 11 years old, is comfortable singing in public. She performed Canada’ national anthem O Canada in Cree at this summer’s World Indigenous Games, and last weekend preformed at the Dreamcatcher conference in the city and the opening of the Healing Garden Ceremony in St. Albert. But she seldom sings her own songs. The Remembrance Day performance moved her audience to tears. The noisy gym went completely silent, except for people crying. The Song is entitled “Hero"
Looking in the enemy’s eyes. Behind sheets of fire hurled across the canal, the 80 men crossed the waterway just before dawn on Oct 6th. Western troops join them at noon and the gallant RMRs continued to fight with the prairie men, with the prairie men, with the prairie men, with the Prarie men. Their backs to the canal they refused to give up anything they held. Do it for your country, do it for your people, do it for your pride. The bridgehead was held for four days and then the Germans pulled back and then the evil pulled back, the first round in the battle was won.